We’ve all been getting used to have our phones working all the time nowadays, our hands all over our tablets and our computer is always on. Constantly busy sharing across the networks what we experienced, we feel isolated if we are not surrounded by devices that we have no idea how to design or fix. The narrative power of contemporary technology is a great result of course, but, as all the most significant achievements, it also implies a reflection. In this specific case it lies within the intervals between what we perceive as virtual, our idealized self and the reality of our experience. The act of communicating with people without using the body, as the internet can allow us to do, is one way through which we can reflect ourselves into the world. But where and which are the very physical connections between our bodies and the world we live in? 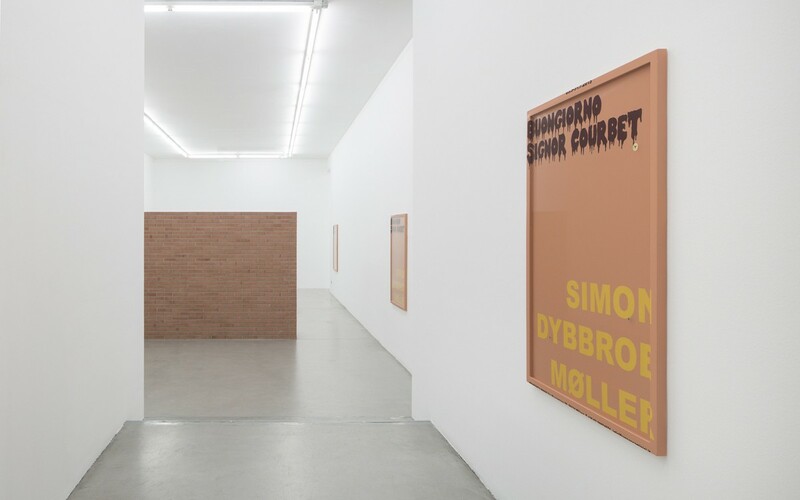 ‘Buongiorno Signor Courbet’, Simon Dybbroe Møller’s current show at Francesca Minini in Milan, explores what remains of our corporeality and of our predigital longings within the space of our everyday lives and, by using the metaphor, it reflects on what makes us feel real . The exhibition’s poster opens the show, telling us already a little about what we should expect to see. The main room is dominated by an exposed brick wall. By redesigning the boundaries of the gallery, on the one hand it invites the viewers to experience the space through its physical limits, on the other hand it tells about our relationship to the idea of real estate. Historically speaking, the meaning we are used to attribute to every thing existing in the world around us is the result of a shared valuation. A kind of knowledge that reinvents itself over the time according to the evolution of socio-economical and cultural circumstances. Also an exposed brick wall is envisioned and interpreted differently in the course of time. In the not so distant past it would have been identified with political connotations. Today it refers to a sense of liberalism and it is consequently shaped by each viewer’s own life experiences. 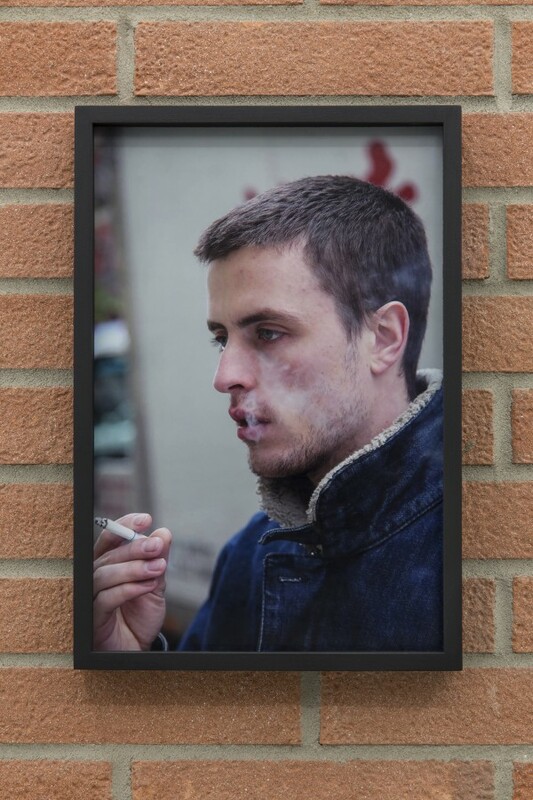 The portrait of a guy smoking a cigarette stands out on the wall. On the other side of it, a blue/yellow-coloured bike saying ‘Ken Burns’ contributes to evoke an idea of urban environment. It could easily be a newyorker artist’s loft, for example. Finally, a series of Duravit urinal dividers found in men’s bathrooms, arise from the gallery walls. Also these“shame shields”participate in our own existence; after all ‘ceramics is what survives from a civilization’, as the artist says.